Got back from the beach, and we had such a great time! My only complaint is that the trip wasn't long enough ;-) Saturday was our only full day there, so the girls and I hit the beach and stayed the entire day. It was THE perfect beach day! The temp was in the 80's, the water was cold at first touch but warmed up, and the company was perfect :-) I wasn't planning to get my pregnant self all the way out past the breaking waves, but I couldn't resist... and i'm so glad I did! That night, the girls and I saw SITC2. I wasn't expecting a quality movie, and it definitely wasn't, but it was entertaining. Here's a layout I made shortly before I left - just for fun! Haven't done one of those in awhile! 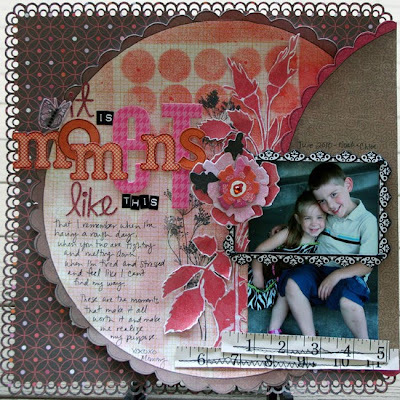 The papers are mostly Crate Paper, the letters are Sass, Doodlebug and Heidi Swapp, and the frame is MM. I also had fun with my new Martha Stewart border punch. Chloe started camp today at her dance school. It's princess camp every morning this week. Noah is going this week, Tues-Fri mornings, so we got to have a mommy/son date this morning, which was long overdue. We went bowling, and I have to say, I think I did better with my 7 month pregnant belly than I normally do lol. We then played some arcade games and hit the store before picking up Chloe.... great morning! Oh, btw, we're having a blog hop this Friday morning at AMM - it should be lots of fun! I'm pretty exhausted these days, so i'm going to go relax a bit before we start bedtime for the kids. Hope everyone had a great weekend! That is wonderful that you could scrap just because!!! and it turned out wonderful girl! It's always nice to do those pages for yourself, with no strings attached! It's a beautiful page, as always. I have that punch too... love it! Glad you had a nice time at the beach! Sounds perfect! I love it! I have been eying up that punch too- you big enabler you. you are the Queen of using frames , hun !! This layout is soo trademark of you !!! I am loving that MS border punch design too ! Oooh, the beach! I want to go, I want to go! Would sure love to put my tootsies in the sand and bob in the waves for a bit. Sounds delicious! Love your beautiful page, Staci! The way you used the die-cut paper is fabulous, and I love the titlework. Love the masking and the tape measures bits, too. dang girl. just got back and already posting. and out past the breakers . . . craziness! love the layout of your sweet peas. Glad you had fun, and I love the new page! SO glad that you had a great time!!! OHHHHHHHHHHHHH...I adore that LO!!! So many perfect details!!! So glad you got to get away for a bit! Sounds like fun! We're hoping to head to the beach later this summer, too. What a fun layout! SO LOVE it! I'm glad that you had fun at the beach (hope you took some pics). pictures! we want pictures!! :D i bet you're looking awesome with your tan now. hey girlie! Glad you are feeling well and enjoying life, even if you are a bit tired. Love the LO as always...the framing around the photo is perfect!